Replica cars are becoming increasingly popular with enthusiasts, and you can buy kits that will build everything from a Ferrari F40 replica through to a 're-imagined' Austin-Healey-a-like. 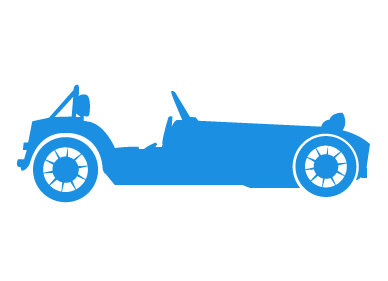 Why would you go elsewhere to insure your replica when Adrian Flux is the UK's largest and longest established kit car insurance broker? We have been insuring replica cars of all types for over 40 years, now, and we have a huge range of specialist kit and replica car insurance schemes, from a wide choice of insurance providers, so we are able to offer replica car cover for every circumstance, whether you are a young driver, have a classic replica kit or if you need track day cover. From a Challenger E-Type to a Cheetah Cobra 427, from a Superstratos to a Spyder Porsche 550 replica , from a Replica Ferrari 355 to one of the many Lotus Seven replicas available. Whether your car is a replica of a classic supercar, vintage track icon or modern racer. If you can build it, we can cover it! Agreed valuations many insurers will only pay out the 'market value' of your car if you suffer a total loss. With a replica car, market value is often difficult to determine, and kitcars are often undervalued by non-specialists. We can assess your car and agree cover for its true value, so you won't get a nasty surprise if you need to make a claim. Goods In Transit cover to cover you collecting your kit car, parts and tools from the manufacturers. Multi-vehicle cover most kit car owners own at least one more car. We can cover all of your vehicles, for a single low premium, and because we know that kit car drivers are a good risk, we can usually offer a very competitive price. Build Up Cover so your kitcar and its parts are fully protected from theft or mishap during assembly. Remember, all our replica car policies are tailor made and are designed especially for the out of the ordinary and our staff have a high degree of knowledge in this field. Our staff are all seasoned insurance experts and will calculate your premium individually, using their expert knowledge of the many insurance schemes on offer. When you call us you will be speaking to a knowledgeable enthusiast, based in the UK, not a button pusher in a foreign call centre. All this, as well as our tailor made Replica Car insurance schemes means that we believe we offer the best quotation service around. Quicker & Cheaper rates by phone complete the call me form during office hours (9am to 7pm Monday to Friday & 9am to 4pm Saturday) for an immediate, no-obligation replica car insurance quote. Some of the many replica makes and models we can cover include replicas such as Lotus Super Seven / Clubman, Morgan replicas, Ford GT40, Ferrari Daytona, Lamborghini, Porsche replicas, classic Jaguar Replicas, race car replicars, Lancia Stratos replicas, Lola T70 and more.